Information technology is ever-changing, and that means that those who are working, or planning to work, in the field of IT management must always be learning. 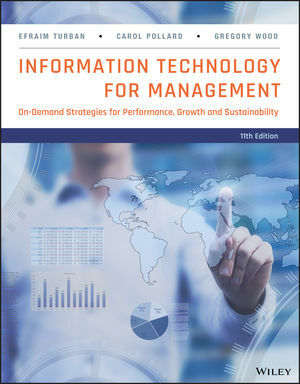 In the new edition of the acclaimed Information Technology for Management, the latest developments in the real world of IT management are covered in detail thanks to the input of IT managers and practitioners from top companies and organizations from around the world. Focusing on both the underlying technological developments in the field and the important business drivers performance, growth and sustainability—the text will help students explore and understand the vital importance of IT’s role vis-a-vis the three components of business performance improvement: people, processes, and technology. The book also features a blended learning approach that employs content that is presented visually, textually, and interactively to enable students with different learning styles to easily understand and retain information. Coverage of next technologies is up to date, including cutting-edged technologies, and case studies help to reinforce material in a way that few texts can. A series of chapter summary whiteboard animations – available only through the enhanced ePub (ISBN: 978-1-118-89086-8 ) version of the product – summarize the content of each chapter in an entertaining way to engage the students in grasping the subject matter.